The Rodgers digital organ was installed in Grace Lutheran's sanctuary in November 2008. Each organ in the Rodgers Masterpiece Series is created individually with the adaptability to play for any worship style. Our instrument was designed to contain many of the pipes and sounds from our former pipe organ and has been "voiced" to the unique acoustics of our sanctuary. 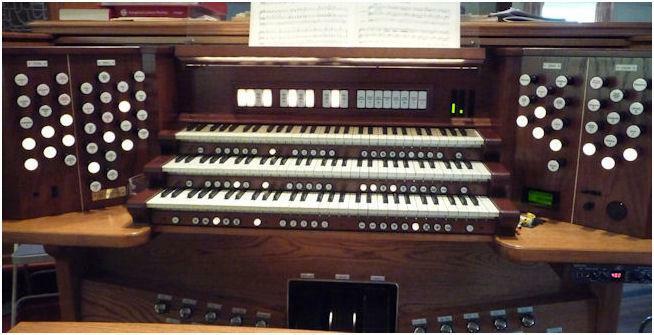 This three-manual organ contains 58 stops and 74 ranks in primary specification. Twelve speakers carry stereophonic sound throughout the Sanctuary and Social Hall. A variety of orchestral, vocal, and instrumental sounds can be programmed to accompany the pipe organ sound. In the hands of a talented organist, such as our music director Scott Breiner, the versatility of this instrument is almost limitless. The Adult Choir is led by Music Director Scott Breiner. This is a SATB Choir composed of 20+ singers. On Sundays the choir performs an anthem during the Offertory. Occassionally, other special music (e.g., choir numbers, smaller groups, or solos) is incorporated into the Service. The choir sings all year for the 10:15 a.m. Service. On occassion, other choirs and/or choristers join in for special music or concerts. Choir rehersals are held on Thursday evenings from 7:00 p.m. to about 8:30 and at 9:45 a.m. immediately after the Adult Forum and before the 10:15 a.m. Worship Service on Sunday mornings. New members are always welcome. Contact Scott for further information.